Android Q has become a trending discussion; this is in anticipation of its release, later this year. Users and developers of the Android Operating System cannot wait to get hold of it. It is expected to introduce a newer set of features and consolidate on the previous ones, with general improvements all around. What new features have the Google Android developers improved on? What fixes must be implemented this time? What do we expect it to be labeled? The Android 10 also known as Android Q is expected to be released at the annual Google I/O 2019 conference, scheduled to hold around May 7 to May 9, 2019. In this event, Google introduces its upcoming Android version release. The Android version is very likely to be followed by a series of updates. Following its tradition, Google always brings on improvement to existing Android characteristics, as well as introduce new features that are in line with technological developments and innovation in the smartphone world. That stated, it will be deemed too early to predict the full features of the upcoming Android version, given how Google has always kept discrete, the details of the operating system until it is close to the official unveiling. Looking at Android’s popularity and usage, tech professionals and lovers can undertake an android app development certification training course which provides useful insights regarding the OS, thus enhancing your learnings, skills, and abilities. Google and other overlords ain’t going to cease their technical progressions where one can make a wise choice to improve their proficiency by taking up these well-formulated courses. What will Android 10 be named? When will the Android Q be released? It is expected to take the path and timeframe of the previous two versions. A developer assessment of the Android Q is scheduled to be held before the Public Beta Version would be released. The official version is supposed to be rolled out first to Google Pixel 3, Google Pixel 3XL and Android One devices while other OEMs will be available in subsequent months. The full list of expected features of the Android Q is not sure of, at the moment. 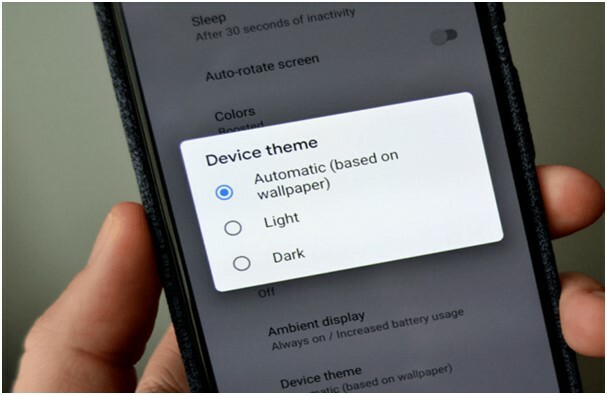 The dark system interface mode will be an excellent addition to the other features that we expect on the Android Q operating system. This feature will reduce battery consumption on various devices. It has also been confirmed that all departments of the user interface will be themed black; the settings menu, notification centers, and system apps will all be themed black, according to Tech Advisor. There is proof that facial recognition will be included in Android’s biometrics. With native recognition, there could be a suitable replacement for other less secure methods, which are easy to outwit. The idea of the face ID technology emanated from Google, but its inability to entirely build on it has lead to is non-inclusion in the previous android versions. The 10.0 version is also presumed to feature a Desktop/PC Mode. It is expected to resemble the formats used in Huawei’s Projection Mode and Samsung Dex. This brings about a PC-like experience, not excluding full-sized icons, work processes, resizable app windows and access to keyboard and mouse. In the same release, it has also been indicated that undoing an app update would be possible. This can assist if the new version of an app seems to be unfavorable or ineffective. The analysts have also found out that Android Q would prevent the apps running in the background from getting access to the contents of the clipboard. This also enhances security and privacy by a distant mile. Android Q is also expected to improve on its font formats, it is projected to include over a hundred more font types and languages, and get updates on its emojis base, for its G-Board. Newer emojis such as a deaf and dumb character, a kneeling character, a flying doctor, a Hindu temple, a yawning face and so many more collections would be included along. This feature adds the appropriate country code automatically. Implemented in some applications and devices already, it is not on Android as a native feature. This feature is of great assistance to international travelers. The Play Store currently works with the policy of making ‘Android 8.0 ready apps’, the Android 10.0 will warn the users that it is installing an app based on an older Android version. With this update, it informs the users about installing an older app, which would be inefficient on the new Android OS. This is a super feature that aids the multitasking process of the Android OS. It enables applications to run in the background independently and actively, even while interacting with other apps. This feature very much supports the split-screen process completely. Currently, while using the split-screen process, only an application can be active at a time when two apps are open in a tab. This will be taken care of in the new Multi-resume feature. It isn't entirely a new feature, but it is better than you have ever seen. This characteristic would enable us to increase the unlock period of our device and also lock it when the device is not trusted anymore; this brings about an improved privacy experience. Android Q will have a comprehensive permission base. Also, settings would be customized to suit the user’s preference, which could be either to enable grant ‘every time,' or ‘only when the application is in use, etc. According to XDA Developers, access to the microphone, camera, browser history and even location by the applications, can now be monitored by the users. With the expectation of new foldable devices, Google had shown support for them and will likely support foldable display capacity in Android Q. They declared that they support the idea of more foldable phones in the Android Market. It is also reported that Google is working on a default file manager for the Android 10 OS; all smartphones running the OS and upward will have the same file manager, irrespective of their manufacturers. Also, password-protect features will also be added to the folders. Other exciting features expected include: Call Blocking; it blocks unknown, private and pay-phone numbers, Printer Support; where devices can now be linked to Printers through Wi-Fi direct, and Password Protected Folders. Initial access to Android Q would be granted for assessment; this was announced at the Android Development Summit 2018. This means the source code of the operating system will be released to the Android users and developers for testing before the day it will be officially unveiled. As the features expected are quite numerous and intriguing, which of them are you most excited about? Do let us know in your comments.